Pakistan's military finally launched its operation in Waziristan today after nearly a month of official announcements telling everyone to expect its imminent execution. Londonstani's been eagerly watching the news to find out more, but the details have been limited. 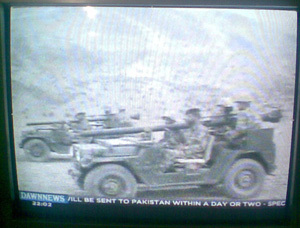 As it stands all news outlets are repeating varients of the general line that planes and artillary have bombed known Taliban positions while 20,000 to 25,000 Pakistani troops have moved the area. However, some outlets are reporting that troops have enountered stiff resistance while others are quoting officials saying that it's been easy going, because they have not entered Pakistani Taliban strongholds. Officials saying five Pakistani soldiers and 60 Taliban fighters have been killed. Since everyone pretty much knew the operation was coming people have been fleeing the area. Reports say more than 100,000 have fled the area and officials have been saying on television that they expect the total to reach about 250,000. So what's really going on in the area? Well, no one really knows. Journalists who requested to accompany troops on this offensive were turned down. The Pakistani military might want everyone to think this will be the most surgical operation of all time, however, it's not international opinion that's going to count here. The Pakistani military needs to assert its authority in these areas AND resettle the population and rebuild the area as soon as possible. It's going to be the locals' opinion that's going to decide whether the Taliban come back. The following lines from Time magazine make the point that what the Pakistani military is trying to do here is not just fight the Taliban, but to defy history. And now the Pakistani Army is making yet another effort to achieve what no one ever has in Waziristan, part of the FATA (Federally Administered Tribal Areas) in the Northwest Frontier Province. One can only wish them well. This is the offensive that the U.S. government was hoping for, made necessary by the surge of terrorist attacks in Pakistan over the past few weeks. As Jane Perlez notes, the Pakistani Army has tried this three times before and failed--but this time the stakes are higher, given the recent advances the Taliban have made. While it's true that history is not destined to repeat itself, it's worth being aware of which side of it you stand.